The emergence of mobile applications has fundamentally changed the way that millions of people around the world work, play, and communicate. Users can now download every type of application imaginable – from games, to maps, to movie and TV show tie – ins, to apps that will turn a device into a flashlight, and more –directly to their smart phones and other mobile devices. Though the market for mobile apps is still relatively young, it has grown exponentially over the past several years and will continue to expand rapidly. Fueled by millions of consumers and business users looking for innovative applications, this explosive growth presents a tremendous opportunity for software developers looking to create – and monetize – the next hit app to help people be more productive, or simply have fun. But developers aren’t the only ones looking to profit from the surge in apps – cybercriminals want to infect and exploit as many mobile devices as they can to steal confidential information. Infected apps are not only a threat to mobile device users, but also to network and platform providers, device manufacturers, and the reputation of the industry as a whole. Fortunately, developers can protect their code – and their customers – with a straightforward and easy-to-manage technology: code signing certificates. 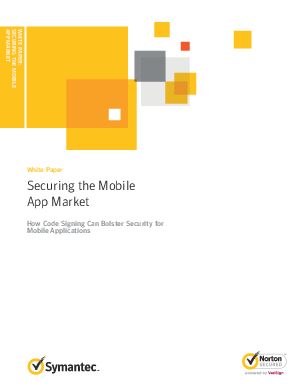 This white paper will detail the rise of mobile applications and why code signing certificates are essential to protecting the entire mobile apps ecosystem.